Hart Hall opened in 1963, with fellow high rise dormitory Funnelle following soon after. Built in the center of campus, Hart Hall utilizes the dining and workout facilities of Cooper Dining Hall, which it shares with Funnelle. 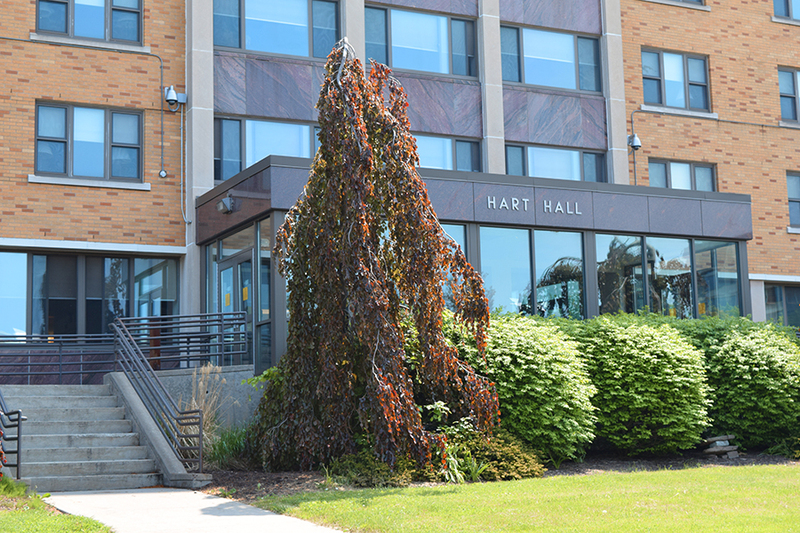 Hart Hall was named in honor of Isabella Hart, a graduate of the Oswego Normal School in 1907, who also taught at SUNY Oswego from 1921 until she retired in 1947. Hart was a member of the state and national geographers’ societies and was one of the first teachers to use visual aids and field trips to enhance the learning environment for students. It was because of her long career at the College of Oswego that she became a historical asset and recognized source of knowledge for administration, students and alumni. In 1957, 50 years after her graduation from Oswego, she was made an honorary member of the Alumni Association.